A rubber tree plant (Ficus elastica), is a stunning houseplant with big, shiny leaves that will soon become a standout among your indoor plant collection. Rubber tree plants aren't difficult to grow, and as long as the rubber tree plant has a good balance of water and light, it will beautify your home environment for many years. Start a plant from a stem cutting, and before you know it, you'll have a brand new rubber tree. 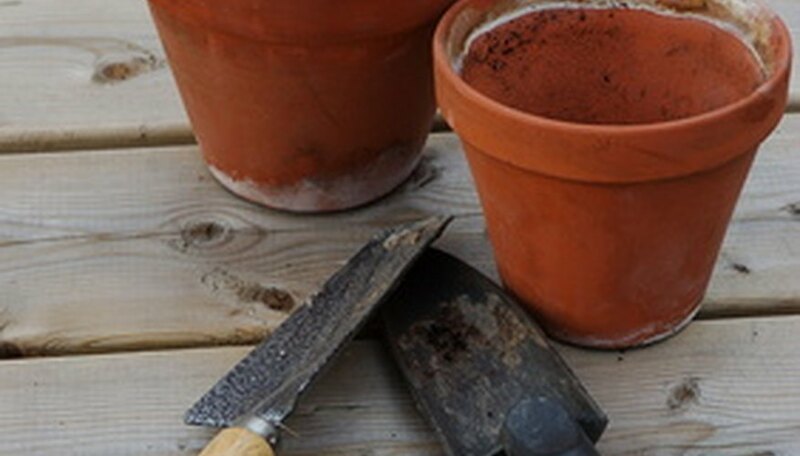 Fill a planting container with clean, coarse sand or a mixture of peat moss and perlite. Set the container in a saucer of water so the potting can absorb water through the drainage hole. Remove the container from the water as soon as the soil is damp. Set the container aside while you prepare the rubber tree cuttings. Cut a 5- to 6-inch stem from a healthy rubber tree plant. The stem should have at least two leaves, and the cut should be made at an angle, directly under a leaf. Make the cut with a clean razor blade or a sharp knife that has been wiped with rubbing alcohol. Strip the bottom leaves off the rubber tree stem cutting. Dip the cut end of the stem cutting in rooting hormone. Plant the stem cutting in the potting mixture with the bare stem in the potting mixture and the leaf above (not touching the potting mixture). Use clean scissors to cut the rubber tree leaf in half horizontally. A smaller leaf will result in less moisture loss, and will take up less room in the container. Put a clear plastic bag over the container. If necessary, put a few sticks in the soil so the plastic doesn't touch the rubber tree leaf. Secure the plastic bag on the planting container with a rubber band. Place the rubber tree cutting in a sunny, warm spot. Don't put the cutting directly in a sunny window, because the sunlight magnified by the plastic will burn the rubber tree leaf. The plastic bag will retain moisture and the rubber tree cuttings shouldn't require water, but if the potting mixture dries out, loosen the plastic and spray inside the bag. Check in two to three weeks to determine if the rubber tree plant has taken root. Tug lightly on the rubber tree leaf, and if you feel resistance to the tug, the leaf has rooted. Remove the plastic and move the new rubber tree plant to bright but filtered light, such as a sunny window covered by a sheer curtain. Keep the soil moist.